Mission Point Lighthouse sits at the end of picturesque Old Mission Peninsula. It is a truly unique destination that has been an important part of the Old Mission community and local maritime history since 1870. While the Lighthouse is no longer operational, visitors can enjoy its quaint atmosphere in many ways: the Lighthouse itself is open to museum tours and tower climbs (see below for admission rates); there are miles of wooded trails in Lighthouse Park; the beach is a rock collectors dream; and the overall peace and serenity the park offers at any time of year makes it the spot for hikers, bikers, snowshoe enthusiasts, and cross-country skiers. 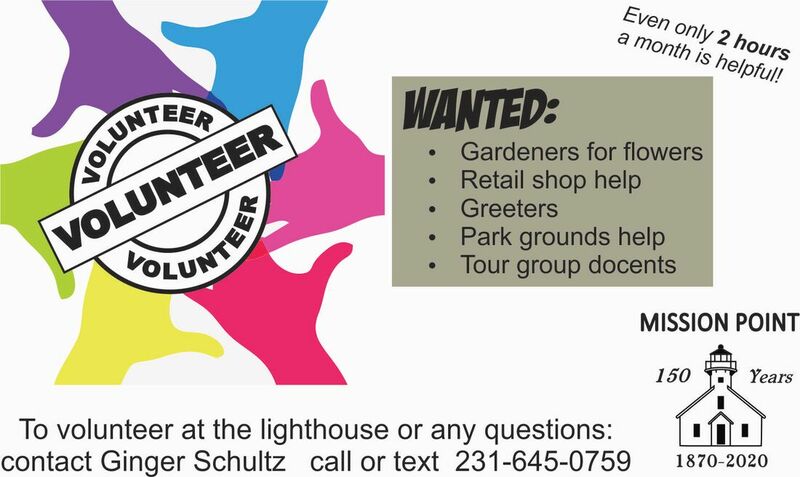 Mission Point Lighthouse is seeking volunteers! The lighthouse is open for tours and gift shop business daily from May-October 10:00 am - 5:00 pm. November noon - 4:00 pm on Friday, Saturday and Sunday and the number of visitors is continuously increasing. The lighthouse is closed to the public December - April but the park and trails are open year round. Volunteer Lighthouse Keepers run the gift shop which collects admissions to view the museum and tower upstairs and sells merchandise. The volunteers also perform daily maintenance, cleaning and long-term restoration projects. Mission Point Lighthouse needs local volunteers in the gift shop and museum to occasionally relieve these hard working lighthouse keepers and to simply be available to answer questions for tourists about the peninsula. Local volunteers' shifts are flexible and we encourage volunteers to commit to as few as 2 hours a month. With continued support and help from the community, the lighthouse will continue to serve as a preserved piece of history for all to enjoy. Please contact Ginger Schultz at (231) 645-0759 if you are interested in helping. Group Tour prices available for large groups, scouts, school groups, etc. Call 231-645-0759 for information. Click here for a full history of Mission Point Lighthouse. Click here Lighthouse Historic Structure Report. Click here for information about how you can become a lighthouse keeper. Click ﻿here ﻿for information about how you can become a volunteer. Click here for Lighthouse Keeper Application and here for the Keeper Handbook. For any other questions or comments, please call the Lighthouse Manager at 231-645-0759.